A lovely high quality satin sash personalised with the name of Mum to be, Grandma To Be, Big Sister, Aunty To Be, Daddy To Be etc. You choose! NOW AVAILABLE IN PASTEL BLUE, PASTEL PINK, WHITE, BLACK, EMERALD GREEN, ROYAL BLUE, SUNSHINE YELLOW, NAVY BLUE, HOT PINK, PURPLE & RED SATIN. NOW PRINTED FRONT & BACK IF REQUIRED WITH AN IMAGE OF YOUR CHOICE! A special sash for the guest of honour to wear. Choose Mum's name to be printed onto the sash, simply Mum To Be, Yummy Mummy, Sarah's Baby Shower, Daddy To Be, Chief Nappy Changer! 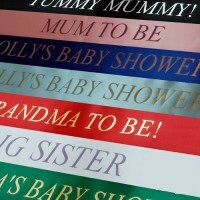 Favourite Aunt, Grandma To Be, Babysitter To Be or personalisation of your choice - Please enter your personalisation details into the text box below, making sure you put exactly what you would like printing on your sash where it asks you to do so. We can print the front & back for you. Then you can choose from either metallic silver, metallic gold, black, blue, white, red, matt silver, matt gold, green, tangerine orange, pink, sunshine yellow or purple print for your personalisation. If you would like us to print your logo onto your sash, please email this to us in a jpg format. This will be printed in the same colour as your chosen font. Please select below. Your sash will arrive untied so that you can tie it around your own special baby bump! All sashes are approximately 2m long. * Each sash is supplied with an adhesive velcro fastener that is easy to attach onto the position that you require in order to fasten your sash. 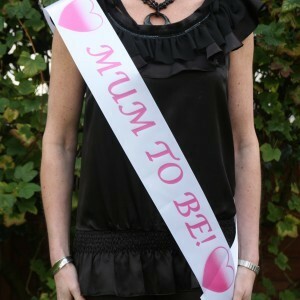 We can also put an image onto your sash to give it that wow factor! Your chosen image will be printed at the beginning and end of your chosen personalised text and will be printed in the same colour as your chosen font. The additional cost for this is just £0.25. If you require images on your sash then please select below. We can print your sash front & back with different messages or the same message front & back for the same price if required. If you do not require any print on the back of your text, please leave the text box below blank.